Tired of the endless stream of junk in your mailbox? You're not alone. "I dread going to the mailbox," says Katie Hough, a Midwest mom. "It's rare that I get something that's addressed to me and not the 'current resident.'" Hough's mailbox, like those across the country, sees an average 1.5 pieces of "personalized" mail (including bills) a week compared to the average 16 pieces of junk mail ending up in mailboxes. Those 16 pieces can become quite heavy, adding up to an average 41 pounds of junk mail annually per household. "That's a lot of trees being sent to the circular file," says Hough. "I'd love to put an end to that." It seems even the junk mailers might agree. If junk mail is undeliverable (if it's addressed incorrectly), it usually ends up in a postal Dumpster. It's just too expensive for senders to pay to have junk returned to them. 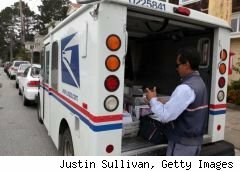 "The United States Postal Service throws away approximately 35% of all ad mail every year," says Geoffrey Hollander, owner, Northwest Data Services, a Portland, OR, company that provides consumer mailing list services to advertisers. There's so much money in junk mail, in fact, that the U.S. Postal Service wants the endless stream of catalogs, credit card offers and coupons flowing to your mailbox to have a moniker makeover. "If it were 'junk' you wouldn't get as much as you do. You get it because it works," says Gerald McKiernan, media relations manager for the USPS, preferring the terms "direct mail" or "advertising mail" over "junk mail." Environmentalists side with Hough, claiming junk mail leaves a carbon footprint equal to 9 million cars, seven U.S. states combined, or the emissions generated by heating nearly 13 million homes for the winter, according to a report by ForestEthics. But, despite the nuisance felt at the mailbox, or eco-activists lobbying for the end of junk -- err "ad" mail, supporters present a pretty good argument that filling up mail carrier's satchels is profitable. And may even be good for the economy. "Direct advertising mail and catalogs account for more than $702 billion in U.S. sales and 10 million jobs annually," says Neil O'Keefe, vice president of the Direct Marketing Association, a company that represents about 80% of the credit card, home insurance and magazine subscription offers stuffed in your mail box. Want to put your mailbox on a diet? "I've tried calling catalog companies, but I still get so much junk mail," says Hough. Although it won't be easy -- or quick -- in addition to contacting the advertiser directly, spending a few hours pulling your name off of these folk's lists can see a dramatic reduction in the amount of junk you'll have to tote to your trash bin. Acxiom U.S: To request an opt-out form, call 1-877-774-2094 or complete the on-line form at: www.acxiom.com/opt-out-request-form. Catalog Companies. They should stop showing up when your other removal requests are processed. You can also call the catalog company directly and ask to be removed or visit Catalog Choice. Credit bureaus. Contact all three (Equifax www.equifax.com, Experian www.experian.com, and Trans Union www.transunion.com) and request they no longer release your information. Direct Marketing Association. Visit www.dmachoice.orgLet's you opt out of all their offers entirely, or choose who you still want to hear from. Do Not Mail Registry. An online petition of more than 90,000 clamoring to end junk mail. www.donotmail.org. Opt-Out Prescreen. Opts you out of credit card and insurance offers. Choose 5 year opt out online or permanent opt out which requires you snail mail a form (they provide). Call 1-888-567-8688 (888-5-OPT-OUT) or go to OptOutPrescreen.com. Just don't expect instant results. Junk mail lists are rented, shared and sold weeks -- in some case months -- ahead of when a mailing might be generated. So it's likely that you'll receive direct ad mail as many as two to three months after plastering your name on every imaginable "do not mail" list. Gina Roberts-Grey is a freelance writer specializing in health. celebrity and consumer issues.